The following measures have been identified by AssureWel as being important to assess for broilers. The criteria to select these 'core' measures included consideration as to how practical they are to assess on-farm. *Additionally a slightly revised alternative protocol for organic systems (option B) is currently being finalised, the protocol will be available Autumn 2017. A further objective is to research and develop the methodology for assessing the welfare characteristics of different methods of broiler production. This information may be of use in future discussions on welfare labeling of poultry products. 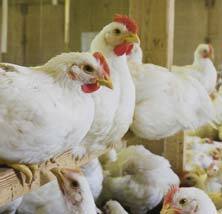 The first stage to meet this objective includes 30 broiler farm visits (being completed winter 2011/12) that have been arranged with assistance from the British Poultry Council and individual poultry companies. During the visits, a set of outcome based assessments (including Welfare Quality® measures) are being used to assess their suitability for use in the range of poultry production systems found in the UK. Analysis of the data from these visits will help to inform decisions further on in the project in developing pragmatic AssureWel assessment methods which can be applied in UK broiler production. For more information on this study and AssureWel broiler welfare outcome measures please contact us.